The guy from the E.T./Haunted Mansion vlog has a source that claims Tomorrowland will become a Titanic themed area. Will Space Mountain be rethemed to iceberg mountain? Apparently, the entire land will periodically sink by pumping water from the lagoon where the submarine ride will remain exploring the wrecked remains. Titanic will in effect be raised. It's going to be great. Or the new space mountain overlay "SPACE MOUNTAIN: JACK'S ESCAPE"
I'd love to see a retro 1990's overlay; SPACE MOUNTAIN: PRESENTED BY FEDERAL EXPRESS! 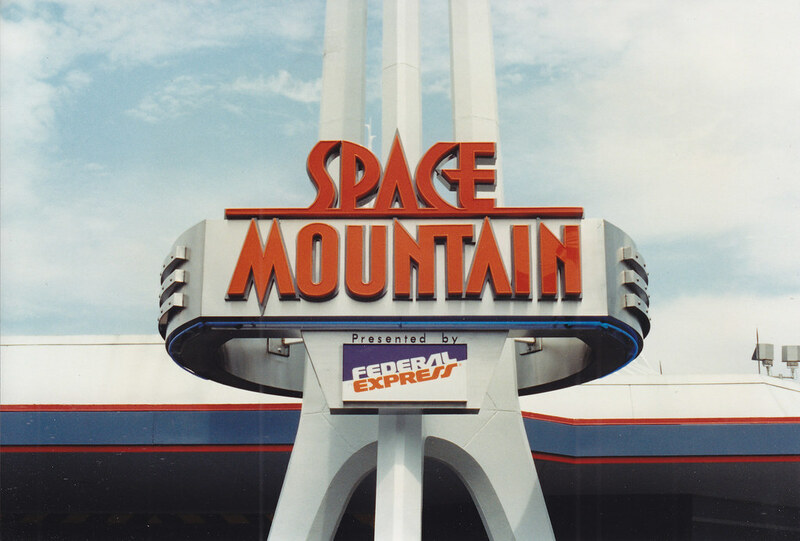 fed ex space mountain is actually my favorite sponsorship overlay. Got fun and cheesy preshows, a fun little story about intergalatic mail, just lots of fun! Agreed. 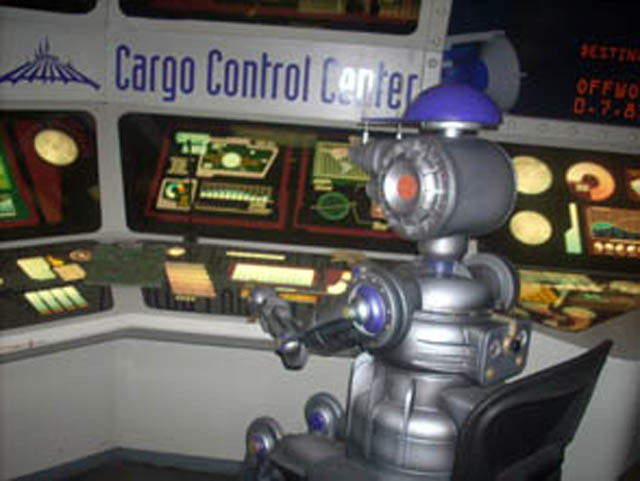 The pre-show robots staffing the "Cargo Control Center" even wore little purple FedEx hats. Because you weren't just rocketing through space, you were helping to deliver cargo for FedEx. Hysterical! I have an inside source from the guy who sells Kennedy, Krushchev, and Castro masks in Fantasyland. He told me that Big Thunder Mountain will get a McDonald’s sponsorship. It will be about Ronald mining for golden fries, but “the King” and “the Chicken Man” are trying to destroy McDonald’s wonderful food . It’ll be fun, thrilling, and encourage child obesity. I highly doubt the Tomorrowland major project rumors are true. The main reason being, if Disneyland is doing all these projects to have maximum capacity and relieve traffic for Star Wars Land, why would they close a bunch of attractions during this hugely busy time? I couldn't imagine all these major tomorrowland attractions being down at once. My guess is things are a while away for major improvements to Tomorrowland. The rocks I could see them doing soon though. I have no doubts that at some point Tomorrowland will be redone, I just don't think that's happening anytime soon. Give SWL a bit of time to sink in and let crowds normalize a bit. I could see it happening sometime after the new Marvel area is completed at DCA. Has to be some give and take on capacity. Maybe its time for @TP2000 to have another drink with the neighbor lady. It's a better story than you're in Space Mountain and a giant ghost head is trying to kill you or nonsensically suddenly being in a Star Wars themed roller coaster despite the entire setup being nothing like SW.
Star Tours really should’ve been the Fedex ride. I think the whole point of the TL redo rumors popping up now is that priorities have changed. A full blown Marvel Land isn't coming in 2020 like was suppose to happen, only Phase 1 which is still murky on details. So a TL redo with the prep stuff happening like PeopleMover tracks inside the buildings being removed I can believe to be happening soon. It could also explain why the second floor of Launch Bay was never completed. Seriously, why should the world's biggest entertainment company be in a hurry to fix the ugliest, most embarrassing land in the resort? It's not like Disneyland's world-famous or anything. Why should they be concerned that millions of guests are wondering why such a successful park has left so much to rot and decay in plain sight--for 20 years? Spending hundreds of millions on an unwanted and poorly-executed Paradise Pier overlay was much more important, right? Wait.... this system exists, yet some of the regular posters have been able to stick around for over a decade? No wonder those forums are so toxic. I don't disagree that it needs tons of work but they won't do it now because they don't "need" to do it given packed parks. If folks stopped riding the rides in the land, maybe their would be a red flag for them. Coming soon to Disneyland Park in 2021, as apart of a Tomorrowland overhaul bring Moana to the Submarine Lagoon and Aladdin to the Star Tours simulators, a new reimagined Space Mountain experience will open. The new reimagined Space Mountain will take guests into a renovated old warehouse factory from Disney Imagineers who liked to use the warehouse to create concept art, napkin sketches, and plans to create the expansions to the Disneyland Resort. The story now tells NASA who has now bought the space to host a Space Simulator, placing you in a fake rocket on a roller coaster through the warehouse with fans, space noises, and cardboard cutouts to simulate you flying through space. The warehouse boats cool architectural elements like concrete, steel beams and exposed brick walls that reveal its storied past—all while creating an airy, bright and eclectic warehouse ambiance. Well, it looks like Jedi training is closing at Hollywood Studios too, so I suppose it is to provide less Star Wars outside of Galaxy's Edge.